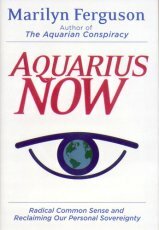 In Aquarius Now Marilyn Ferguson tells the truth we don't want to face -- we have no enemy except ourselves and the mess we've made individually and collectively by refusing to look at what we're doing to our bodies, our minds, our society, and the Earth itself. We've been seduced by the Cult of Numbers, caught in a web of mindless materialism, obsessed with competition, with winning and losing, afraid of anything that can't be seen or measured, and in the grip of an economic model where only that which generates more money is worth pursuing. Movement pioneer Ferguson revisits the paradigm wars she described in her watershed bestseller The Aquarian Conspiracy and offers an imposing array of insights, strategies, tools, and personal experiments -- all consistent with a powerful constellation of ideas and principles clearly visible on the horizon of a more mindful society. The imbalance we see outside ourselves only mirrors the imbalance within. The way to heal the imbalance is to heal ourselves. We have to stop thinking of ourselves as conquerors and start thinking of ourselves as fellow travelers with every living being on this planet. The task is not to climb a mountain, but to navigate a river. We need to take responsibility for our own actions. We need to heed the words of our many available teachers, including our own founders, among them Thomas Paine, whose Common Sense rallied out ancestors to create a new country and more. "We have it in our power to begin the world again," Paine wrote. Thomas Paine's stubborn idealism seems suddenly imperative. Is there a choice? Aquarius Now is the map at the mall. "You are here," and the way is plain. Finally.